Scotland will break new ground by appointing joint bosses following the departure of long-serving head coach Steve McCormack. Featherstone Rovers’ John Duffy and Wakefield Trinity’s Chris Chester will share the job as they succeed McCormack, who stepped down after the 2017 World Cup after 13 years in the role. The first opportunity for Duffy and Chester, unveiled at a press conference at Featherstone’s LD Nutrition Stadium, where Wakefield share training facilities, will be the end-of-season European Championship. That event features matches against Wales, France and Ireland and doubles up as a qualifying tournament for the 2021 World Cup. Chester, 39, has been involved with Scotland in the past, having stepped in as assistant coach in 2012 when McCormack was on compassionate leave, while the 37-year-old Duffy’s links go back to 1997 when he won the first of his 12 caps at the age of 16. Duffy, who was also Super League’s youngest debutant when he played for Warrington at 16, joined Scotland’s senior backroom staff ahead of the 2013 World Cup but stepped down last year after taking up the full-time coaching role at Featherstone. He added: “I’ve come through the pathway. In my last two years as a player at Leigh, I started coaching the kids in Edinburgh and Glasgow and places like that and I did a Student World Cup a few years ago. Duffy insists sharing the role will not be a problem. “We’ll work it between us,” he said. “We get on and Wakey train at Featherstone so I see Chris every day. One of the first tasks for the new coaches will be to appoint a captain to succeed Danny Brough, Scotland’s most-capped international who looks to have played his last match for his country. 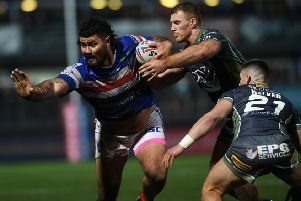 The veteran Huddersfield stand-off was sent home from the World Cup after being too drunk to board a flight from Christchurch to Brisbane and St Helens prop Luke Douglas stepped in to lead the Bravehearts in their final match against Samoa. “We need to find out which players are available and the ruling on domestic players,” Duffy added. “There’s a couple of NRL players who have put their hand up to come over at the end of the year but I’ll have to speak to (chairman) Keith (Hogg).